Send details of City Mews, Plot 3, Saint Stephens Street, Salford, Manchester to a friend by completing the information below. 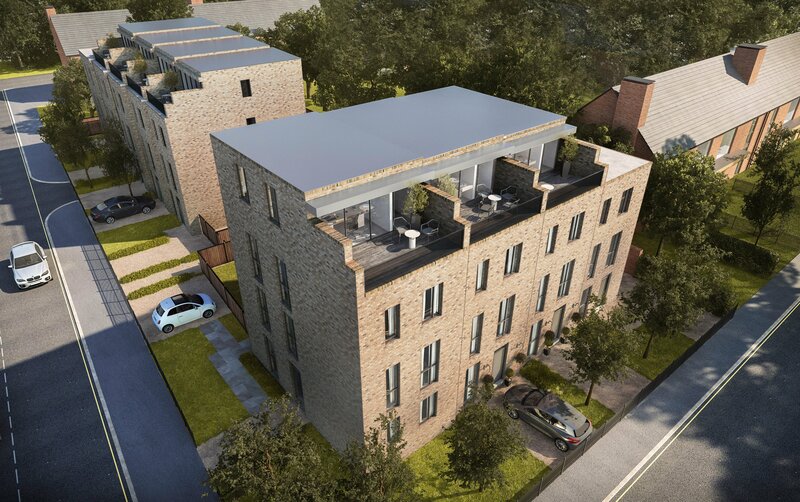 AN EXTREMELY RARE OPPORTUNITY to purchase a brand new 5 DOUBLE BEDROOM END TOWN HOUSE with TWO KITCHENS and up to FIVE BATHROOMS, located on the outskirts of Manchester City Centre and within only a few minutes-walk to popular destinations such Spinningfields, Deansgate and the Lowry Hotel. 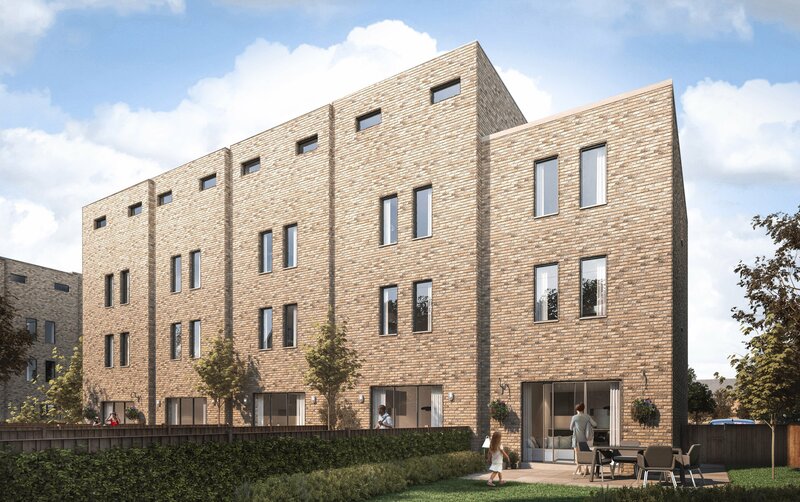 For purchasers who wish for a house with beautiful open plan shared space, then look no further as City Mews is perfect for residents looking for contemporary, spacious and fantastically located new homes. 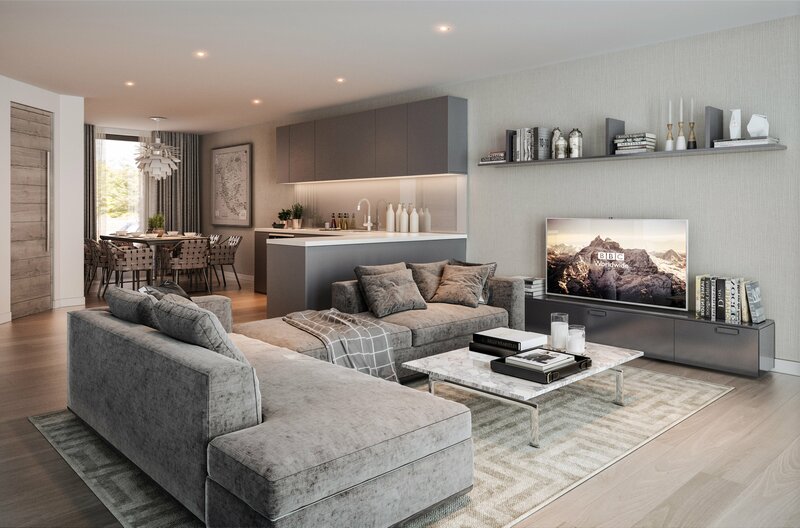 CITY MEWS provides an amazing opportunity to purchase a spacious 5 bedroom, 5 bathrooms, 4 storey town house, with gardens and a roof terrace, located just minutes from Spinningfields, one of Manchester’s key destination places. YES - A HOUSE FOR THE PRICE OF A PENTHOUSE APARTMENT! 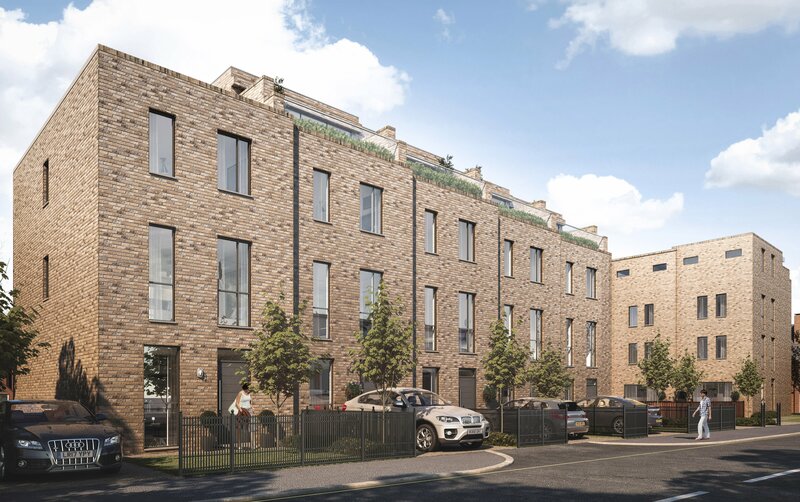 The property is to be located at CITY MEWS, an exciting and quite unique, BRAND-NEW housing development of only 9 bespoke and exclusive, highly appointed houses, which are due for completion in January / March 2020. 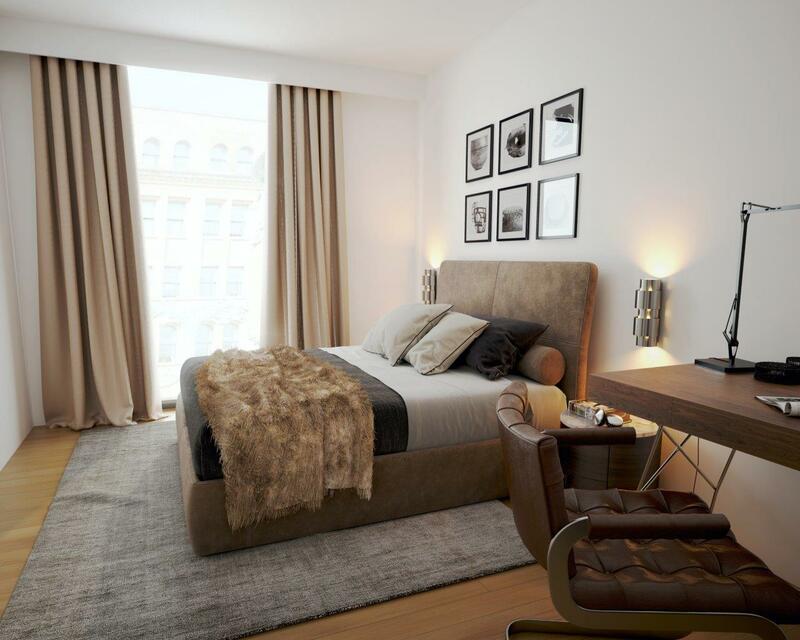 CITY MEWS promises to deliver an outstanding array of large, quality homes. It is an extremely rare opportunity to be able purchase a house of such size in this Salford suburb, so close to Manchester City Centre. The house provides versatile and flexible accommodation, certain to appeal to larger and extended families. GROUND FLOOR: Entrance HALLWAY with staircase to first floor; Downstairs WC. OPEN PLAN LIVING ROOM with dining area, a central feature Kitchen and rear Lounge with glazed doors opening on to the rear patio and garden. FIRST FLOOR: Landing; TWO DOUBLE BEDROOMS; family BATHROOM or the option of 2 EN-SUITE SHOWERS ROOMS. SECOND FLOOR: Landing; TWO DOUBLE BEDROOMS both with EN-SUITE SHOWER ROOMS. 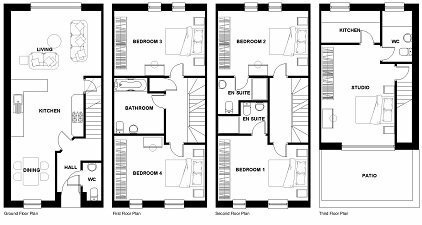 THIRD FLOOR: Master Suite / BEDROOM 5; KITCHENETTE; EN-SUITE with Shower, WC & Wash hand basin; ROOF TOP TERRACE. 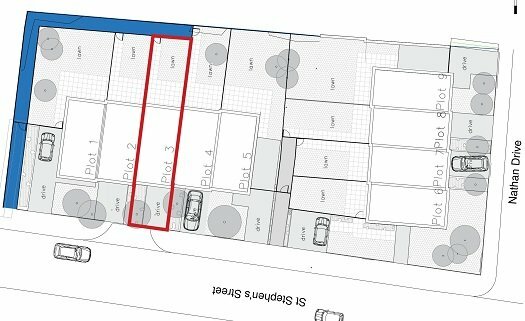 EXTERNALLY: There is a Driveway for off-road parking; and a rear lawn garden and patio area. Whatever the use or combination you choose, the top floor is complimented by a fantastic and rather unique ROOF TOP TERRACE PATIO!!! If the top floor options were not enough, the first floor can be provided with either a Master Bathroom or 2 En-suite Shower rooms, as provided for the second floor. The specification of these houses is amazing. •	Bathrooms & WC’s – Ceramic tile flooring. •	Internal doors pre-painted ‘grey’ flat finish. o	Quartz stone worktops with matching upstand. •	All switch plates contemporary style white plastic. 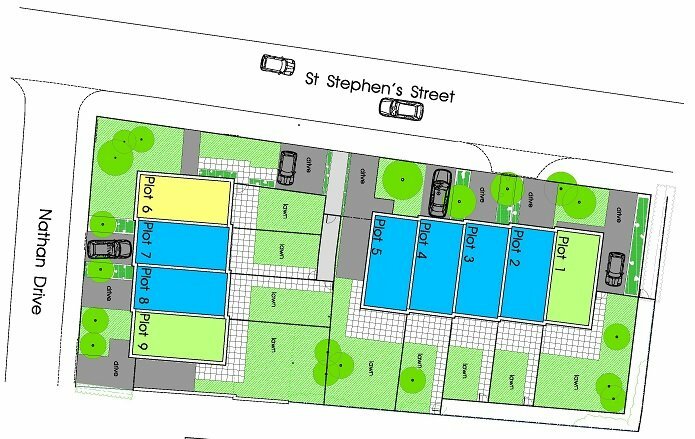 The development is located on Saint Stephens Street, Salford, a small urban residential area close to the Chapel Street area and on the boarder of Manchester City Centre. The house is within easy walking distance of many key city centre destinations such as; The Lowry Hotel, Manchester Arena, Victoria Train Station and Spinningfields. The main designer and boutique shopping areas of King Street, St. Anne’s Square, Harvey Nichols, Selfridges are also within easy reach as is access to Manchester’s nightlife and leisure scene, in particular, the popular bars and restaurants located on and around Deansgate and the Deansgate Locks areas. For purchasers unfamiliar with the location of CITY MEWS, we would like to make mention of Spinningfields, a commercial, residential and leisure area adjacent to CITY MEWS. Often described as the Canary Wharf of Manchester, Spinningfields is the modern financial business centre of Manchester with major employers such as; Regus, Barclays, DAC Beachcroft, Deloitte, HSBC Bank, Grant Thornton International, Guardian Media Group, Royal Bank of Scotland and Civil Justice Centre, housing Manchester’s courts. There are a cluster of desirable restaurants and bars for all budgets, ranging from national chains such as; Café Rouge, Carluccio’s, Gourmet Burger Kitchen, Ha! Ha!, Giraffe, Strada and Zizzi to bespoke offerings from Artisan, Oast, The Alchemist, Australasia, and Manchester House. The famous, celebrity VIP nightspot, Bijou Club is also nearby. Close to CITY MEWS is Media City, home to 250 businesses including major employers such as the BBC, ITV, Kellogg’s, Ericsson and University of Salford. CITY MEWS is extremely well placed for public transport and commuting to and from the city. Being situated just off Manchester’s inner-city ring road, you are less than a two-minute walk to Salford Central Station linking Victoria Station and the Metrolink Tram system to the city centre and Media City at Salford Quays. The X50 bus connects the neighbourhood to the city centre and the Trafford Centre. The M60 Orbital Motorway is within very easy reach form the M602. Wash hand basin with tiled splash back; low level WC, extractor fan; radiator; tiled flooring. Full height double glazed window to the front of the property; radiator; ‘Amtico’ flooring. A central kitchen with a range of ccontemporary high-quality specialist-designed kitchens including; handleless kitchen doors; Quartz stone worktops with matching upstand; inset sink unit; Integrated appliances including; cooker hob, oven & grill, chimney extractor fan, integrated fridge freezer. Under stair storage cupboard; ‘Amtico’ flooring. Full height sliding double glazed doors opening onto the rear patio and garden; TV point; radiator; ‘Amtico’ flooring. Staircase and balustrade leading to the second floor. Bedroom 3: 4.59m x 3.32m. Two double glazed windows overlooking the rear of the property; TV point; radiator. Two double glazed windows overlooking the front of the property; TV point; radiator. extractor fan; half height wall tiling with full height around the bath; ceramic floor tiling. NB: There is an option for two en-suite shower rooms to be installed in place of a family bathroom. Staircase and balustrade leading to the third floor. Bedroom 2: 4.59m x 3.32m. ‘Villeroy & Boch’ sanitaryware with ‘Grohe’ brassware and taps comprising; enclosed shower cubical with screen and full height wall tiling, vanity wash hand basin, low level WC. Chrome heated towel rail; extractor fan; half height wall tiling; ceramic floor tiling. Sliding double glazed doors opening onto the roof top terrace overlooking the front of the property; TV point; radiator. ‘Villeroy & Boch’ sanitaryware with ‘Grohe’ brassware and taps comprising; enclosed shower cubical with screen and full height wall tiling, vanity wash hand basin, low level WC. Chrome heated towel rail; extractor fan; half height wall tiling; ceramic floor tiling; double glazed window overlooking the rear of the property. Fitted with a small range of kitchen units with worktop surface and inset sink unit; double glazed windows overlooking the rear of the property. Front: - Driveway providing off road parking; small planted boarder with wrought iron fencing. Rear: - Enclosed rear lawn garden with timber fencing; Rear access gate; Patio area next to the house. 1. Construction is due to commences in February 2019. 2. Build Completion of the homes is estimated January to March 2020. 2. The Reservation Fee is subject the Construction Consumer Code (copy of the Consumer Code is attached to our advertisement and available on request). 3. Buyers are prepared to Exchange Contracts within 6 weeks of the issue of a legal contract to their solicitor, with a deposit equal to 15% of the asking price. 4. The deposit will be on fully protected terms. The property will be sold with a 10-year build warranty and deposit protection insurance during the construction phase. The provider will be advised at the time of reservation. The property will be sold with a 250 Leasehold Title, which will be subject to a peppercorn ground rent (small annual payment). The EPC band cannot be assessed at this stage. The EPC certificate and band will be provided before completion. The property is being sold on off-plan terms. At this stage we are unable to undertake viewings of the property or arrange site meetings. We can arrange telephone meetings and meetings in our offices, by appointment, with potential purchasers, to discuss the development and property in more detail. To arrange an appointment to discuss the purchase, please telephone 0161 406 0044.